The smell of hamburgers filled the room as girls in poodle skirts and boys in leather jackets danced in and out of tables. The chorus’ second annual “Night at the Hop” took place in the cafeteria Nov.6, raising more than $8,000 for the group’s future gig in Hawaii. 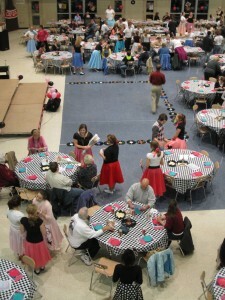 Decorated in checkered tablecloths, pink and green streamers, and old records, the entire event was designed around a 50’s diner theme. Preparations begin hours ahead of "Night at the Hop"
Chorus member, Estefania Perdomo, explained that students got their jacket and skirts off of Ebay, at Good Will stores and said to help out, she made her own skirt along with six others. After a few hours of set-up, the guests arrived and the singing began. Performers included the chorus members, a school band called Manhunt, and even Melissa Telesco, the chorus teacher. 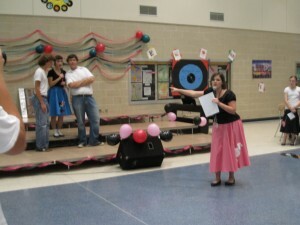 The song list covered many classic 50’s hits to match the décor, and ranged from artists Johnny Cash to the Ronnettes. Entertainment also included swing dance. According to Dakota Jordan, he and other students in the chorus were taught by Corina Connelly and Jill Wiley. Jordan stated, “We practiced after school for four weeks” to prepare for the festivities. Students took turns serving their tables so that while one of them was singing, the other was taking orders and making runs to the kitchen for food. They served hamburgers and cheese burgers, soda, French fries, baked beans, and cole slaw. For dessert there was apple cobbler and banana pudding, and milk shakes to wash it all down. 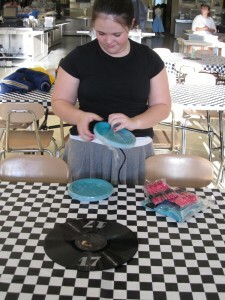 Poodle skirts and saddle shoes were in vogue during "A Night at the Hop"
The students also hosted a raffle, the largest and final prize being a handmade wooden cabinet. The raffle also included smaller prizes such as gift cards and framed photos. Tucker said, “Everyone’s doing a great job helping out” and at the end of the night she said she felt the event was a great success. The event was planned in order to help minimize the cost of a trip scheduled to take place in 2011. The chorus will be traveling to Hawaii to perform at the 70th anniversary of the attack on Pearl Harbor. Telesco said the event was a huge success that they would be continuing the tradition next year.